“Impeccable performances, but undersold by its musical confines.” Brendan Macdonald reviews the new musical based on Vaudeville stars Daisy and Violet Hilton. Side Show at Southwark Playhouse. Daisy and Violet Hilton, the women Side Show is based on, were conjoined twins who surfaced from the Sideshow circuit in depression-era America to become stars of Vaudeville as ‘The ‘Hilton Sisters’ Revue’. They were actors in Tod Browning’s cult-classic and controversial Freaks, along with being friends of Harry Houdini. Their story, situated within a long history of American spectatorship and its fetishization of non-normative bodies, is complex, fascinating, tragic – and overwhelming. Side Show is an attempt to transpose this remarkable story into a musical, and it does so with varying degrees of success. The Vaudeville numbers are secure and confident, but a lot of the score is meandering. It’s also coupled with underwhelming lyrics that don’t probe much into the psychology of either of the main characters. The repetitive playful puns, ‘Very Well-Connected’ or ‘Stuck With You’, make perfect sense in the Vaudeville world but are overused in the first act and become tired in the second. The production itself is more successful, with Director Hannah Chissick creating a textured and troubled world for the starlets. The scaffolding-like stage that houses the band glows with warm filament bulbs. Matthew Cole’s choreography is slick and inventive and the ensemble are polished, tight, and charming. But the central performances by Louise Dearman and Laura Pitt-Pulford as Daisy and Violet are the main attraction. Not only endlessly gifted vocally, they both do an impressive job of conveying fully realised, nuanced, and endearing characters, without too much disneyfication. Haydn Oakley as Terry, an ambitious Vaudeville producer with an eye for the Orpheum circuit, is also excellent, singing ‘Private Conversation’ with a wrenching and ominous introspection. The problem, however, is that even with impeccable performances, the story seems undersold by its musical confines. The catchiest number, a strong power ballad sung exquisitely by Dearman and Pitt-Pulford, is also the most frustrating. ‘I Will Never Leave You’ is the sort of musical theatre number jazz-handers everywhere crave – an eleven o’clock anthem with a resounding chorus and charged (if not simplistic) harmonies. It’s supposed to evoke a sense of belonging, of self-worth, and bring a triumphant colour to the narrative. But its lyrics fall short of its target, and instead it feels more like a re-fashioned love song than it does a song of sisterly bonds. It also doesn’t provide the uplift to negate the continuing hardship in these women’s lives. With the future looking less than bright and with their love lives lost, the Hilton sisters are left to depend on a Hollywood producer/director, Tod Browning, a character rooted in a stereotype not known for trustworthiness. The ending reprises the beginning, and alludes perhaps to the cyclical nature of spectatorship or maybe demonstrates that the Hilton sisters are no better off than when they started. Yet neither is made clear; it feels instead as if the story is pigeonholed into the genre of the motivational musical. A tension arises between the story being told and the story that lies underneath. Racial politics and sexual shame are crucial to the narrative, and Chissick hastily gestures at the end towards the problematic relationship between audience and performer — the possibility of fetishism, of exploitation, and of power imbalance. The moment doesn’t quite work, but it’s a step in the right direction. It demonstrates the real potential in such a remarkable story that has not quite been harnessed in this musical adaptation. 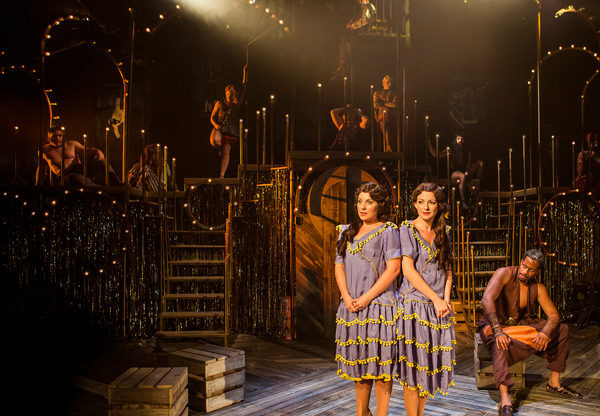 Side Show is on until 3rd December 2016 at Southwark Playhouse. Click here for more details.